Do you have flat feet which cause you to skimp on the footwear you like most? Or perhaps you suffer from calluses, cracked heels, or athlete’s foot? If you answered yes to any of these questions, then you should definitely look for a foot doctor. After a quick online search, however, you find that a foot doctor can either be a podiatrist or a chiropodist. Which one should you schedule an appointment with? Keep reading to find out how you can put an end to your foot problems. Back in the 60s and 70s, chiropody wasn’t officially considered as a branch of medicine. Chiropodists primarily dealt with providing foot inserts to ease the pain of their patients. The people that visited them the most suffered from arthritis, diabetes, and sports injuries. Over time, chiropody practitioners were required to register before offering their services. In 1977, the term podiatrist replaced chiropodist to end the confusion. It’s worth noting, however, that some countries such as the UK and the USA continue to use the term chiropody, although it doesn’t differ in any shape, form, or fashion from modern podiatry. What Does a Chiropodist or Podiatrist Do? Now that you know that these two terms are interchangeable, it’s time to learn what they can actually do to alleviate your foot problems. If you suffer from any kind of foot issues, be it minor or severe, you should schedule a visit to a chiropody or podiatry clinic. Only a specialised foot doctor can properly diagnose and treat issues with your feet, ankles, and lower limbs. Calluses and corns, hard skin on the feet, and bunions are more than just aesthetic problems. You may have been ignoring these issues for years, thinking that they wouldn’t cause any harm. However, the problem can escalate and soon cause pain even when doing mild movements. A podiatrist can remove calluses, bunions, and hard skin using safe and non-invasive procedures. Another common problem that podiatrists tend to is ingrown toenails. If you’ve suffered from this issue before, then you know how painful it can be. The simple task of walking can prove unbearable. A podiatrist helps pinpoint the root of the problem and advise you on how to properly care for your feet. The same goes for treating any kind of fungal or nail infection. Patients with foot problems often find that they have to be cautious of the shoes they wear. This applies in particular to those with flat feet or high arches. A podiatrist addresses this problem by using orthotic inserts. These provide customised support based on the condition of your feet, allowing you to feel more comfortable while walking. Custom-made insoles prove beneficial if you have biomechanical problems as they help prevent excessive pronation. Chiropodists or podiatrists always prioritize preventive measures over surgery. Regardless of the kind of foot problem you have, expect a podiatrist to give you tips on preventing the condition from getting worse. They also find ways to minimize your pain and discomfort by prescribing the right footwear and custom orthotic inserts. Surgery is a last resort. Podiatrists only take this approach for serious foot issues. This is precisely why you should consult a foot doctor as soon as you feel any abnormalities in your feet, ankles, or lower limbs. It’s better to have the problem diagnosed rather than letting it exacerbate to the point where you must undergo surgery to return back to your normal life. Keep in mind that even mild pain in your foot can accelerate quickly. Before you know it, the pain has already crept up to your lower back and hips, severely limiting your mobility and causing tremendous pain and discomfort. By now, you should have a better understanding of the roles of podiatrists and chiropodists. They should be the first ones to call if you’re dealing with any kind of foot condition or foot-related injury. There’s no need to be confused by the terms. 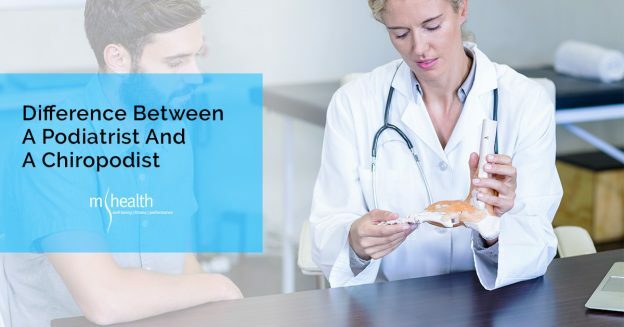 Both professions share the same functions which are to diagnose and treat foot problems, so be sure to book an appointment right now at the nearest chiropody and podiatry clinic in your area. This entry was posted in Tips Physiotherapy & Osteopathy Melbourne on September 24, 2018 by MHEALTH.